This function allows users to view ASN (Advance Shipping Notice) details. This does not show the XML summary of the ASN, but it does show the related document from which the message was created. For details on processing ASNs, see Processing Advance Shipping Notices. 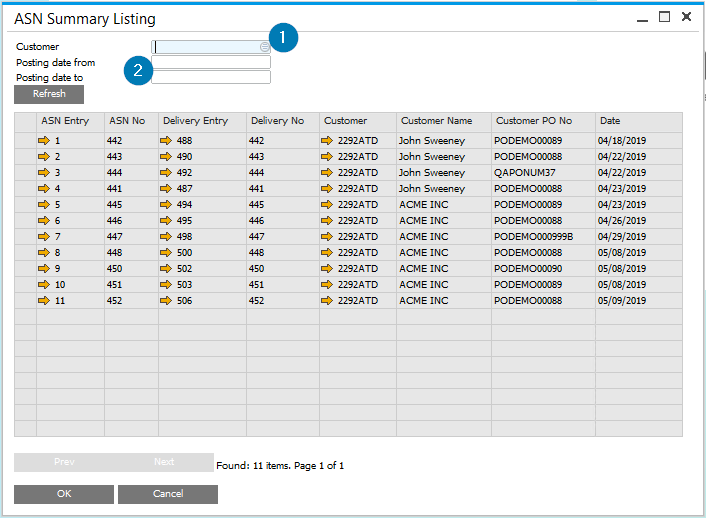 ASN selection can be filtered by Customer Number (see marker 1 in the screenshot below) and Posting Date range (see marker 2 below). ASNs can be filtered by Customer Number (1) or Posting Date (2) as described below. Use this search field to filter by Posting Date range. Start date of the ASN document Posting Date range filter. Use this search field to filter by Posting Date range. End date of the ASN document Posting Date range filter. ASN DocEntry number. Press the golden arrow to open the ASN details window. Delivery DocEntry number. Press the golden arrow to open the Delivery document details window. Press this button to exit the ASN List function.